I very nearly wasn’t there, you know. Wayne, one of my Leeds mates, had offered me a ticket about six months ago, or whenever they went on sale. I demurred initially, I had listened to a Chemical Brothers record in earnest since We Are The Night, whenever that came out. On its release, I’d given Born in the Echoes a couple of goes, but nothing had really stuck. The Chemicals, to me, seemed a long way away from the duo that had so thrilled with 1995’s Exit Planet Dust and then followed that with what some may regard as their defining album, Dig Your Own Hole. So, we met in Finsbury Park’s magnificent Twelve Pins after work on Friday. A few beers there, then up on the train to Ally Pally. A while since I’ve done that walk up the hill, it hasn’t become any less tedious. A queue, a laugh at the drugs amnesty box parked at the entrance. Chicken and chips, another beer, the toilets and then in, stage left (or right, depending on your perspective). The warm up DJ was on, he spun for another ten minutes or so before disappearing. Fair play to the Chemical boys (as a work colleague had called them earlier in the day), they didn’t keep their expectant crowd waiting too long. As the predatory synth line of Q-Tip collaboration, Go, filled the great hall, a colossal animated man, not the last incredible projection animated or otherwise of the evening, reached floor to ceiling behind the Brothers. This London crowd needed no invitation to, um, go and there was no turning back. Not for me and Wayne anyway, as we pushed away from the musclebound and immobile breezeblocks we had been standing next to, further in and further forward into the crowd,. I found myself grateful to, well, myself but also Spotify. I’d been listening to a Chemical Brothers playlist whilst at work, so had managed to update myself on a lot of what I had missed over the last two decades of music. So, when the new song Free Yourself dropped, all bleeps, sirens and exhortations to “Free yourself/ Free me/ Dance”, I was ready to lose myself in the shattering rhythms of this megatune. The motorik of EML Ritual would have found me wondering how I’d missed it when listening to Born In The Echoes a couple of years back – had I not been bouncing around north London like a beach ball, losing my mind. As it was, EML Ritual gave way to my first real “OHHHHH!” moment. I say “OHHHHH!”, it was more “OH!” “OH!” “OH!”. Or was it more “UH!” “UH!” “UH!”? Yes, Chemical Beats, from Exit Panet Dust went off like a firecracker. As did Star Guitar, helped along by being introduced by a sample of New Order’s Temptation, “Oh you’ve got green eyes” etc… Obviously, there were no complaints from me, although I did find myself thinking about how Star Guitar’s release, with its diet Balearic vibe, was the point at which I began to part ways from the Chemicals all those years ago. There wasn’t much time to dwell on that, because soon enough, the throbbing Hey Boy Hey Girl saw arms aloft all over the joint and at some point glitter had cascaded from the ceiling as we danced and jumped and this was pure and utter exhiliration, The Chemicals were killing us all. And they were doing it without, for me, a large bedrock of familiarity to lay back on. It all got a bit blurry after a bit. Elektrobank kicked off a helter skelter through various Chemical classics, kaleidoscoping past at lightspeed, I caught Music Response and Under The Influence amongst other less familiar tracks and all I could think was “This is so much fun fun fun!” But that thought process might have been helped by the huge beach balls which appeared from nowhere, ping ponged around the hall and then disappeared almost as swiftly as they had arrived. There was a brief pause at some point. Wayne thought they might have technical problems, I thought I was having, the best gig ever, night of my life. The pace couldn’t quite be sustained thereafter. in particular, I could have done without Galvanize, but the towering, timeless, Block Rocking Beats brought the main set to a rather emphatic close- and the crowd to near delirium. The encore seemed quite low key, in comparison to what had gone before at least. However, the final track was one guaranteed to send this London crowd home happy, The Private Psychedelic Reel. I didn’t know that the gig would end on this note, but instinctively I think I did know it. I mean, what else could such a wonderful night have finished on? A soothing, psychedelic blast to end two hours of pure euphoria. Yes, yes and, furthermore, yes. As we left the main hall, feeling slightly changed somehow- well, I did anyway- I felt a tap on the shoulder. Someone else I used to work with (nearly as long ago as Wayne and I used to work together) was at the gig and had recognised me. We exchanged brief pleasantries before splitting up into small groups. Wayne and I had a train to catch. Before we made it back down the hill, though, Wayne observed the tradition we instituted at our last gig together (Leftfield, Leeds T&C, April 2000) and bought himself a t-shirt to replace his sodden Fred Perry shirt. I would have bought one, but, well, your man wasn’t selling any XLs. As the train rolled south back to Finsbury Park, we talked of the joy we had experienced during the evening and we made plans to get to another gig soon. I don’t think we’ll be waiting another eighteen years, that’s for sure.. 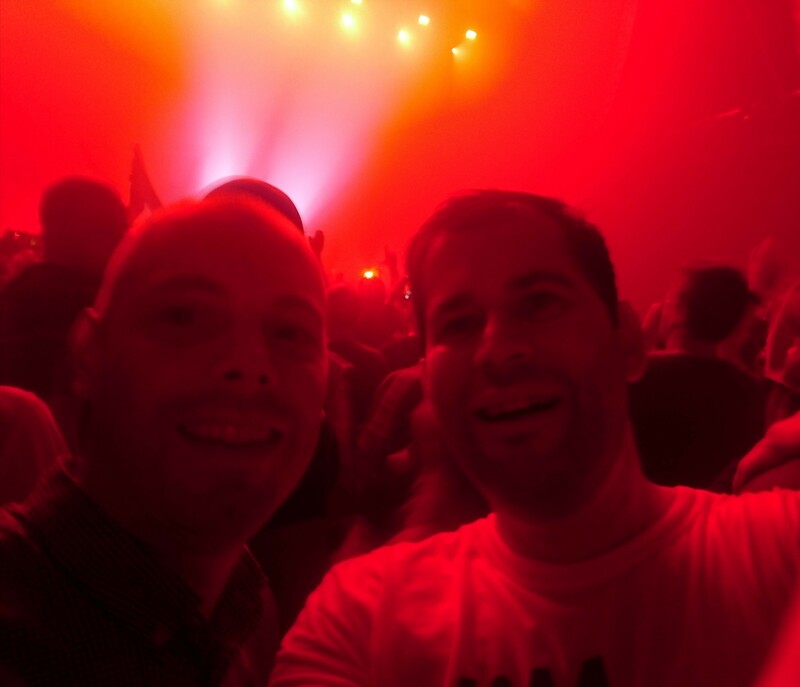 This entry was posted in Music and tagged Ally Pally, Chemical Brothers, live review, London. Bookmark the permalink.